I’m sure we all must have caught a glimpse of “Mary Kom,” Priyanka Chopra’s upcoming biopic wherein she is playing the part of the Olympic bronze medalist, M. C Mary Kom. In the movie, Priyanka has made all the efforts to look,to be and fight like the boxer.There is no doubt that Priyanka has undergone a rigorous amount of training to achieve the strength and body of a boxer. Priyanka is said to have undergone 45 days of rigorous strength training even when she travelled as she had her trainer travel along with her to not miss out on the training. It has even been reported that to make the scenes look real, the director made sure to place Priyanka opposite real life boxers during the fight scenes. Mary Kom, as a boxer starts her day, everyday, by running a distance of 14 kms followed by doing stretches and shadow boxing. 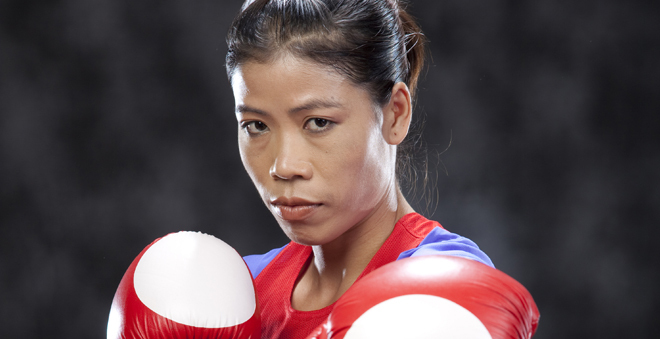 In the evening Mary Kom attends the gym where she carries out strength training and practices her boxing in the ring. An important part of Mary’s workout is to maintain the co- ordination of her brain and eye for speed and power which are the most important for a boxer. Later, she cools off all the heat from the strenuous workouts with a short run. Reading about Mary Kom’s usual day which she has followed for the last 15 years makes us wonder what Priyanka might have gone through during the 45 day training period to look her part in the biopic. The physique and strength that Priyanka portrays in the film has won her a number of applauds in the film industry as well as among the audience who are eager to know what Priyanka’s workout regime and diet was as she lived a boxer’s life. So here’s a brief guide for all you fans out there who are eager to train like Priyanka Chopra in and as Mary Kom, the boxer and achieve her sporty yet feminine look. As I did mention above, Mary’s workout routine everyday is a hectic one and the only time she gets to rest as a boxer is during the afternoon. Priyanka’s trainer made sure to make her workout such that she does not bulk up but maintains a feminine look. And that is what we ladies are scared of aren’t we? So, here are some moves, which you can follow everyday to get that Priyanka- Mary Kom look. The Jump Rope is a fantastic way to get those muscles ready and to increase your stamina. I am sure you must done this a lot as a kid. Start being a kid again. If you do not have a rope, then get one or pretend to hold one while you skip. Like the name, shadow boxing is the action of practicing your punches in open air. Do you remember the movie “Real steel” where Hugh Grant is seen shadow boxing in order to help his robot Adam. This workout helps the boxer to speed up his/ her hands and leg movements before the start of a fight. Stand with your feet together and your hands by your sides. Imagine that there is a hip-high barrier to your immediate left and raise your left leg to step over it. Immediately follow with your right leg. After that, move to the right side and duck your head as low as you can under the barrier. Repeat 10 times more before going in the reverse direction. Do at least three stretching exercises which can help you increase your flexibility. You can even incorporate some simple Yoga poses into your regime for this. Here are some of the yog poses which you can use as stretching exercises. Strength training does more than just make you strong. The many of its additional benefits would be the increase of bone density, stronger joints, improvised balance and stability, more stamina, better posture, and reduced back pain if any. Here are some strength building exercises which you can do after your warm-ups for the given duration and number of repetitions. In order to physically resemble Mary, Priyanka had to also follow the diet that Mary was on. Mary, when asked about her diet, stated that she takes proper nutrition and balance in her diet. She does not indulge in spicy food much and here daily dietary routine consista of light snacks before practice/exercise and a healthy breakfast after practice. She has her lunch between 1-2 pm and dinner at 8-9 pm which is her fixed time. In order to avoid dehydration, Mary drinks a lot of juice and it is her habit to have a glass of milk before going to bed. Priyanka followed the same diet that Mary does as a boxer, so I will be referring to Mary’s diet as we move on ahead. Alike every other boxer, Mary Kom needs to her diet to contain 40% -55% complex carbohydrates for energy, 10% of healthy fats for vitamin and mineral absorption, 40% of lean proteins for strength and muscle-repair, and plenty of fluids and electrolytes for hydration and stamina. Taking into consideration all these percentages this is the diet plan that can be chalked out for the perfect feminine boxer body. So let’s take a look at a proper diet plan that boxer’s follow for that healthy, strong, and swift body. As you carry out the diet remember as the sports person that you are to keep yourself hydrated at all times and to drink as much as 5- 10 glasses of water after each meal and snack. Junk foods should be a complete no- no for you. Enjoy your workout and diet and do it the boxer way.